This is the third time I've checked In Other Rooms, Other Wonders out of the library. As much as I like fiction, I don't really enjoy short stories (I don't know why, it makes no sense), and it wasn't until I found out that the stories loosely connect (like in Jhumpa Lahiri's Unaccustomed Earth) around a central character, that I convinced myself that I could read the book, because isn't a novel just a bunch of connected stories? The stories in In Other Rooms, Other Wonders mostly take place in Pakistan, and focus on people who have connections to wealthy landowner KK Harouni. However the characters range from servants, to electricians, to fallen gentry, rising local politicians, and other wealthy Pakistanis. All in all, they give an interesting picture into the ways that people from different, clearly delineated social classes interact. Mueenuddin focuses particularly on the vulnerability of women within the culture. My favorite story is "Our Lady of Paris," which seemed particularly close to the author's heart and experience. I'd heard lots of buzz about The Elegance of the Hedgehog. 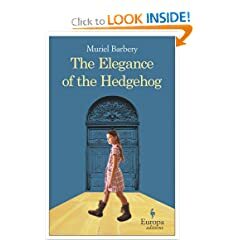 Every time I looked up a book on Amazon, their specially formulated computer spit out that that I should really be reading The Elegance of the Hedgehog. I'm nothing if not obliging, so I read it. The book is a translation of a novel that was originally published in France four or five years ago. The basic premise of the novel is that there's a misunderstood and brilliant middle-aged concierge and a misunderstood and brilliant twelve-year-old girl living in the same fancy Paris apartment building. Both of them are lonely and frustrated until an older Japanese gentlemen moves into the building and the three come together and find meaning in their lives. Even after Mr. Mind-Reader of the Amazon recommended the book, I seriously considered quitting it in the first hundred pages, which was filled with philosophical musings of people I'd never heard of before. But I'm glad I didn't. The action takes place in the last hundred pages, even the last twenty pages. And just like life, this book doesn't end the way you may want it to. I'm a notorious read the last page first kind of girl, and I was really disappointed that I knew what was coming in this book. I predict a beautiful and angsty French film will come out in the near future. If you pick it up, just remember, it's French, and unlike those of us in America, they're comfortable with angst and tragedy in their art. 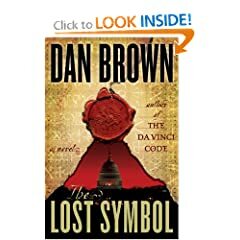 I'm not the only one who has been down on Dan Brown in the last decade. I sat down with the DaVinci Code and didn't get up for two days, until it was done. Then I spent the next month picking it apart and finding inconsistencies and rethinking places where the writing could have been tighter. This time around, I sat down with The Lost Symbol, and had a thoroughly good time reading for two days. And I'm not going to do it this time. I'm not going to pick it apart and talk about how the ending was a let-down, or I could tell from the fifth or sixth chapter what the real identity of the villain was (although I knew it! I knew it! ), instead, I'm just going to say that for two days, I had a lot of fun following Robert Langdon around Washington DC and figuring out puzzles. Do I feel like an expert on Masonry or symbology? If course not? Do I think that Robert and Katherine will ride off in the sunset together? Maybe for as long as James Bond stays with a Bond girl. That's okay, it was fun while it lasted. Is it awful to say that I really don't remember a lot of the specifics that Bronson and Merryman talk about in NurtureShock? It's an interesting book, well-written and well-researched, but for some reason it just wasn't all that memorable for me. Maybe I'm just trying to block out of my mind that I've spent the last decade giving my kids the wrong kind of praise, which may be turning them into underachievers? Or maybe because I've been suckered into believing that my "gifted" third grader really is smart, and not just an early maturer when she took the test in kindergarten? Or maybe, possibly, because sometimes my kids stay up as late as I do? Bronson and Merryman tackle ten commonly-held ideas in modern parenting, and challenge them, chapter by chapter. It's a good book, and would probably spark interesting conversations in a book club. 2009 is the year of companion memoirs about parenting in the Waldman-Chabon household. I recently reviewed Ayelet Waldman's Bad Mother, and shortly after finishing that book, her husband Michael Chabon's take on parenting came through. I'm glad I read Waldman's memoir first. It's an easy, straightforward and thought-provoking read. A good book, a book I'd like to discuss with my book club. But Chabon's book? Chabon's book is beautiful (I'll admit to a literary crush on Michael Chabon). It's not a linear book, more a series of short (sometimes as short as a page) essays and musings on his role as a man, specifically as it relates to parenthood and husbandhood and sonhood. He writes about an early sexual experience with a friend of his mother, about the props he gets for grocery shopping with his kids (when women who do the same thing aren't seen as doing anything special), about his new man purse and how much he likes it. It can be pretty random at times, but that's part of the charm. But it's also a book that only a well-regarded, seasoned writer could produce. It's a risky book for a publisher to produce, a book that an unknown, not Pulitzer Prize winning author probably wouldn't have greenlighted. 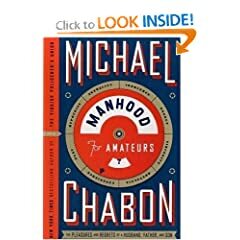 So reading Manhood for Amateurs gave me greater respect for Chabon as a fiction writer, because without his great stories and memorable characters, his musings on manhood would probably sit unpublished on his hard drive in Berkeley. And that would be a great shame. A couple of months ago, I heard Diane Rehm interview E.L. Doctorow about Homer and Langley, his newest novel. I've read a lot of current fiction, but for some reason, I was always afraid of Doctorow. I started reading The March at least three or four times, always giving up after thirty or forty pages. So when I heard the interview about Homer and Langley and thought it sounded interesting, I ordered the book from the library. Homer and Langley is a good introduction to Doctorow. The novel is relatively short, and somewhat loosely based on the fascinating story of real life hermit brothers Homer and Langley Collyer, who packed their Manhattan brownstone so full that once Homer Collyer died, rescue workers had to cut holes to get into the house (the doors and windows were all sealed off with 130 tons of stuff). It took them nearly a month to determine that Langley was dead too, and when they finally removed enough of their hoardings that the found his body less than 10 feet from where Homer was found. 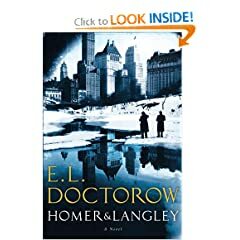 Doctorow presents the story from Homer's perspective, and takes the liberty of blinding Homer from childhood (he actually became blind as an older adult), which makes him less a willing partner in the hoarding and antisocial behaviors and more a victim of Langley's mental illnesses. The book is an interesting read, but I'd guess it's not one of Doctorow's best. It's definitely accessible, and thoughtful, but it's not especially rich or multi-layered (unless you count all of the junk), which is what I had expected (and feared) with Doctorow. 3) Reese's Peanut Butter Cups, along with any of the many derivations of the pb cup (Fast Break, Nutrageous, Whipps, Sticks. Reese's Pieces do not qualify as they have no chocolate). 8) Any of the above in the smaller bite-size format, which is less satisfying by a number of degrees. Full-size candy bars take a spot near the top. The rest, lacking chocolate, is fit only for my children, my husband (despite being in his mid-30s, he still has a serious thing for Skittles), and the garbage can. We're down to M&Ms, some mini sized peanut butter cups, and a whole lot of crap that doesn't even pretend to have any chocolate in it. I've driven past lots of garage sales, but never feel tempted to park my car in the tangle of traffic out front and rifle through someone's cast off stuff. I figure that there's a relatively small chance I'll find something amazing for a steal, and a relatively large chance that I'll feel guilty meeting the hopeful eyes of the sellers. So I stay away. Once when I was in college, I ventured into the Provo DI to hunt for clothes for an 80s dance. The place was huge, overwhelming, I couldn't tell which pieces of clothing were junky castoffs and which ones were diamonds in the rough. My roommates bought rocking outfits, I came home empty-handed and raided my closet instead. So I've had a decades-long, irrational fear of thrift shops. I just feel unequal to the task of sifting, of mentally figuring out what goes with what. But that may be changing. A few weeks ago, I went to Name Droppers for the first time and left with two awesome jackets. It helped that I was sans kids and had the company of some good friends who know their clothes. But it wasn't creepy or dirty or overwhelming or any of the things I had feared. Now that I'm holiday shopping/home decorating/trying to finish my dining room plate project, I've decided that maybe, just maybe I can brave some of SLC's thrift shops. Apparently I live in a great thrift shopping area, but I need your help. Where should I go to get my feet wet? I need places that don't require too much sifting through the chaff, and preferably stuff that leans toward furniture/design/decorating. One of the highlights of this summer was discovering the world's most perfect running trail in Millcreek Canyon. At least once each week I'd park the car at the Pipleline Trailhead parking lot, hike straight up for a mile, then run for six more until I looped back to the car. Once the kids went back to school, it got too dark in the mornings to get the run in and get back in time to get everyone out the door, so I tried to fit a run in on mornings when Eddie was around, or someone was home to watch Maren. Every week slipped into every couple of weeks, and then I started thinking my last run had already happened. I ran it about ten days ago and figured that was my last run for the season. But today was a beautiful day. It was sunny and warm, and Ed was home from work. So I took Isaac to preschool and headed up to the canyon. I hiked the hike, ran along the trail, and enjoyed the peace. During the summer, there are lots of cars and bikers and dogs up there, but today it was just me. Before I reached the road (three miles left in the run) I looked down and realized that the road's shoulder was covered in snow. When I got down to the road, it was slippery, covered with black ice, and even with my trail shoes, I felt nervous that I'd go sliding into the path of an oncoming car. Eventually I ran out of the snow, and I figured out that if I stayed on the shoulder, I wouldn't slip. But I'm retiring the canyon run. At least until the spring.